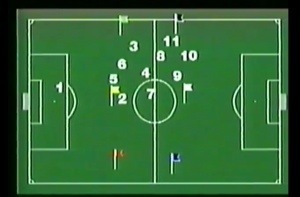 Arrigo Saachi’s 4-4-2 system utilised with AC Milan. Arrigo Sacchi’s route to the AC Milan hot-seat wasn’t of a traditional manager of a top European club with a stellar career which naturally parachuted him into a top job but from more humble beginnings. Sacchi was born in 1946 in Fusignano and didn’t become a professional footballer, but by the age of twenty six was coaching his local team Baracca Lugo, where he himself admitted he needed to command the respect of his players, “I was twenty-six, my goalkeeper was thirty-nine and my centre-forward was thirty-two. I had to win them over” he was quoted. Following spells with Bellaria he managed the youth team at A.C. Cesena, who were in the Serie B. He moved on to Rimini who were playing in the Serie C1 where he almost led them to the title. Following this, he moved to Fiorentina as a youth coach. His achievements with the youth team did not go unnoticed and subsequently interest from Parma F.C arrived, who were in Serie C1. Promotion to Serie B was achieved and following good performances in the Coppa Italia campaign, where Parma defeated Milan on two occasions, Silvio Berlusconi approached Saachi to manage Milan in the 1987-1988 campaign. A key part of his practice was the shadow play drills he ran his team through, seen as revolutionary in continental Europe at the time. Defensively, Saachi would line his team up without opposition, place flags on the pitch to represent the ball and have his players organise into their defensive shape to defend each flag as if it were a player in possession. He would then simulate a ball moving around the pitch with his voice and actions, requiring the players to move accordingly where he would correct positioning in the process. Milan became one of the dominant teams in Europe under Sacchi, winning the European Cup in two successive years. The team he left behind was built upon by Fabio Capello where more success followed. Sacchi went on to manage the Italian national team leading the Azzuri to the World Cup final in 1994, only to lose on penalties to Brazil. He parted company with the national team after a disappointing exit in Euro 96 and is now the national youth coordinator. This entry was posted in Football Tactics and tagged 4-4-2, Arrigo, Azzuri, football, Italy, Milan, Rosoneri, Saachi, Scudetto, soccer, tactics. Bookmark the permalink.